In many of my articles over the past two years, I have tried to explain what is involved in doing Bible translation work. Explaining the process of translation, starting with a rough draft and then the numerous checking stages after that, can be done in words. But as they say, a picture is worth a thousand words. And so that is what I will do for this article, provide you with some links to see some video clips that demonstrate and explain the ministry of Bible translation. Now that you have a little taste of what it takes to translate the Bible into another language and culture of the world, you will want to take a look at this next video. This video clip was just produced by our mission group, Pioneer Bible Translators, and it helps us to see the bigger global picture of Bible translation. We know that God sent His Son, Jesus, to be the Savior of the whole world. But there are still over 2,200 languages in the world that do not have even one verse of Scripture in their language. Now that you have seen these two quick video clips, I want to invite you to view a message that I preached to some churches in eastern Canada a few weeks ago. I was invited to share about the ministry of Bible translation, which I am always happy to do. In my message, I outline “The Task”, “The Challenges” and “The Vision” of Bible translation. The message is about 40 minutes long, so I would like to invite you to sit back now (or at a later time) and catch the vision of what God is doing in the world. I hope you have enjoyed watching these videos as much as I have enjoyed preparing this article and spreading the word of what God is doing through ordinary people like you and me to take God’s Word to the ends of the earth. As Jill and I reflect over the past few months of activity, it is hard to believe that we travelled over 22,000 miles from Calgary, Alberta to Madang, Papua New Guinea and back. That is almost the same as travelling once all the way around the world. We have been doing this once or twice a year now over the past four years, and as far as we can tell, we believe that God is calling us to do this on a regular basis for many more years to come. This past trip has been the longest one for us since our assignment in East Africa in 2006-2007. 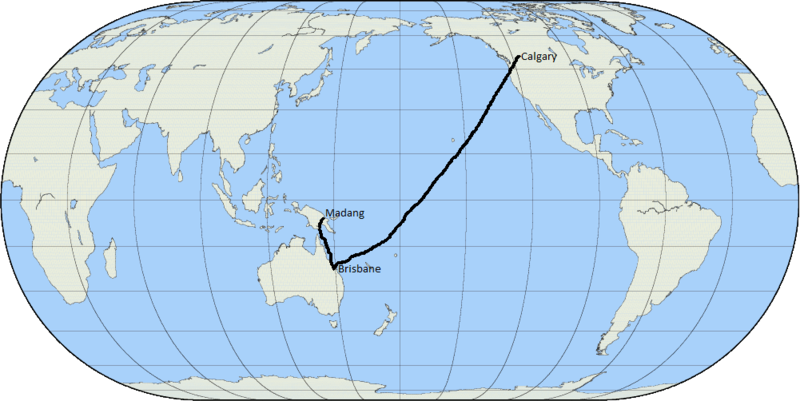 Norm went over first to PNG in mid-January and came back home at the end of April, 3 ½ months in all, and Jill was able to join him for six weeks in the middle. Part of the reason for Norm being over there so long was to help him get out of the cold Canadian winter weather which causes him to be in so much pain in all of his muscles. While there, Norm was able to complete the consultant check of the second half of John in one language. Then he did the Advisor Checking of John in the Akukem language which took two months. 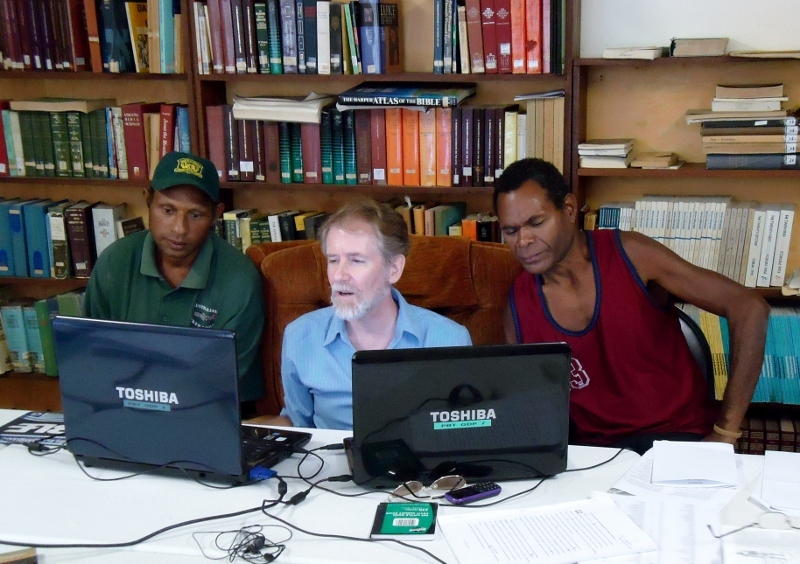 The third project was to do the consultant check on Daniel for the Aruamu who are now working on the Old Testament. Jill was able to help with some curriculum revision work and also assist with some administrative tasks in the office. So what does a Translation Consultant or Advisor do when checking a translation of a book of the Bible? It is hard to summarize in just a few words, but basically we go through a translation verse-by-verse, checking to see if the text accurately reflects the message of the New Testament Greek, or Old Testament Hebrew. We also make sure that the translation sounds natural in the language of the people and communicates well. Sometimes we wrestle with special terms such as “The Passover”. We usually use a descriptive phrase. So is it “the Big-Day-to-remember-when-God-passed-over-the-people-and-now-they-remain-good” or is it “the Big-Day-when-God-freed-His-people-and-they-are-good”? But now some groups know the OT background of the Exodus story and they are starting to use the pidginized English word “Pasova”. Choices can be difficult. Of course there are some funny bloopers that can happen in translation work. Like when the one group tried to use “the big head men” as a term for “Jewish authorities. But one man said that sounded like “big pumpkin-headed people”. So we decided to call them the “the head men” which means the “chief leaders”. It may take weeks or even months to check every verse, but the goal is to present the “clear Word of God”. It is very clear to us that God had His hand upon us and the work we were doing over in PNG. Many people had asked us before the trip if we thought Norm would do well for so long on this trip. Other than dealing with the usual fatigue and pain that he has, Norm did not get sick throughout the entire time, and only missed two half days of work in the three month period. We are so grateful for the hospitality of Carl & Pat Whitehead who let Norm stay with them and moved his recliner chair into their living room so that he could do the checking work for them and their language team. In two weeks time, their book of John was checked and is now ready for publishing. On Valentine’s Day, Norm flew down from the highlands to Madang where our PBT office is, and then greeted Jill who had just come into the country to be with him and to help in the PBT office. What a blessing it was to be together for those next six weeks. And we are so very thankful for all the people who kept us in their prayers and who faithfully gave donations to make it possible for us to go to PNG and do this ministry work. Without such faithful support for us and this work, it would be so much more difficult to do all this. Together, we are all one great big team of God’s people who are working to get the translated Word of God into the hands of the local people of Papua New Guinea. 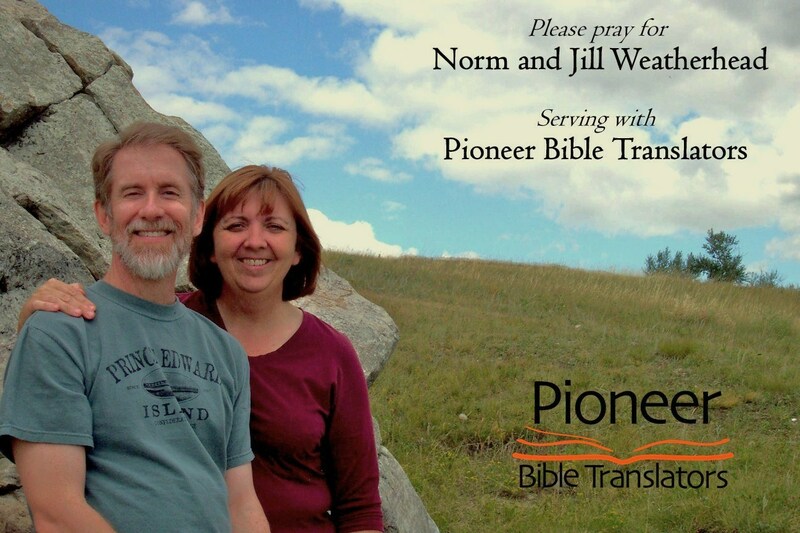 We now know that God has indeed opened up the door for Norm to continue serving as a translation consultant and we just got the news that Jill has been granted her Working Permit for PNG. She should be granted her long-term Entry Visa in the next few weeks. We’re not quite sure what this will mean for Jill, but it does open up the door to do more than volunteer help when Jill comes over with Norm on these trips. We do ask that you pray with us for wisdom for this. During the next 4-5 months we will both be in Calgary as Jill continues her work as a nurse at the hospital here and Norm will work at home on a variety of translation projects. Thank goodness for the Internet, right? In the Fall, we will probably look at Norm spending about six weeks at least in Dallas where our Int’l headquarters are for PBT. He cannot function well physically in colder weather, so we are thankful that he has the option to work at projects while in Dallas. For us to be able to keep going ahead with all that we see God laying before us, we will need more people to consider becoming financial partners with us in this ministry work. We have done well so far in the first half of 2012, but in part that has been because of some special donation gifts. Realistically, we are operating right now at about 75% of our ideal budget. We ask all who read this newsletter to consider responding to the address below to become partners with us in this work. * You can write to us at norm.weatherhead@gmail.com if you would like to know how to become a financial partner with us in this ministry work of bringing God’s Word to the people of Papua New Guinea.